June, full garden revamp is in effect! Plants, plants, and more plants, digging, moving, removing. The cottage garden is in, my veggie gardens are in and my backyard is in the midst of a mini makeover so color of the month is GREEN all the way! On a more serious note, I’m dedicating this color of the month post to our family friend Jim. He passed away Memorial Day and will be greatly missed by my family. His inquisitive mind, quarky sense of humor, and kindness will not be forgotten. I could never thank him enough for how much he believed in me and my business. Always following what I was doing, buying pieces, even though I would be just as happy to give him whatever he wanted. Jim, maybe you’re still reading these from a new place of comfort, peace, and rest-we love you and will miss you, and thank you. 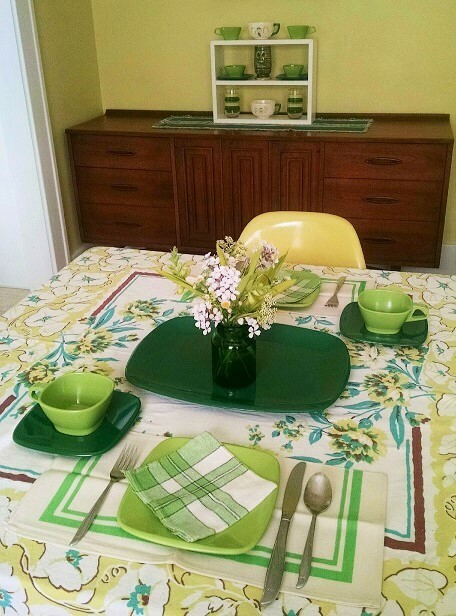 Fave vintage: melmac cups n saucers, striped glasses (I have a bunch in shop!) 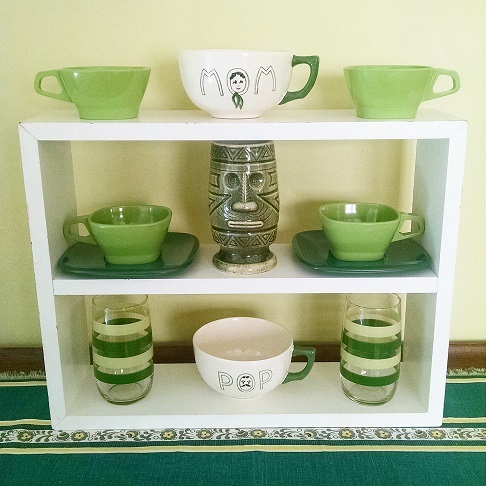 Tiki mug, mom n pop mugs, a striped vintage runner. 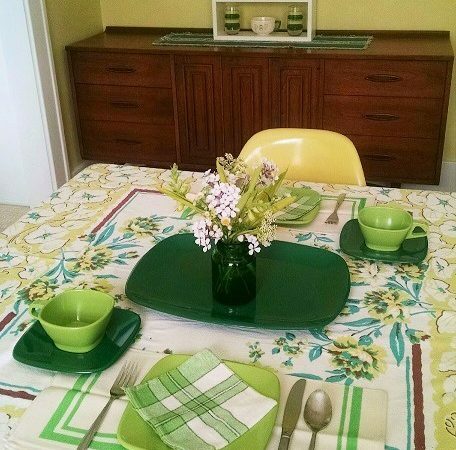 Fave vintage: tablecloth, napkins, melmac, and flowers from my garden. Melmac available now in my vintage shop! I’m using 2 different vintage napkins here, one as a place mat and one to use.